A reader asked what would be my top five things to do in Maui on a week-long vacation. Though a challenging task, I narrowed down so many wonderful things to do and see to just five. 1. Go to the top of Haleakala, an inactive volcano, preferably to stargaze and watch sunrise. The top of Haleakala is the highest point on Maui and the views are wonderful. Before you go, please read my advice on visiting Haleakala at sunrise. You can also find more information on planning your visit to Haleakala National Park on their website. 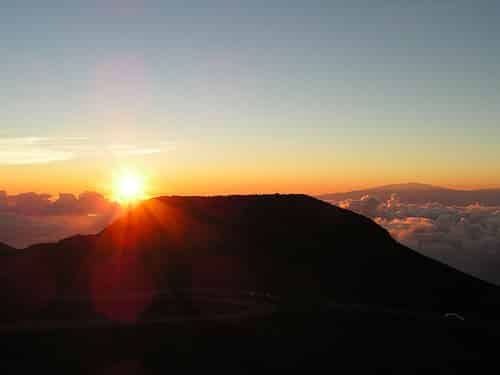 It works best to plan a sunrise visit to Haleakala the first or second morning of your vacation, particularly if you are coming from the mainland. You’ll be jet lagged and have no problems waking up early enough to catch some star gazing before sunrise. With the elevation of Haleakala summit being over 10,000 feet above sea level, temperatures are chilly compared to Maui’s beaches. Be prepared by bringing a jacket or sweater. Haleakala sunrises are practically breath taking. 2. Spend a day touring the road to Hana. This coastal road winds through a rainforest. You’ll see beautiful beaches, lava cliffs and waterfalls. Everyone calls this curvy drive “the road to Hana”, but don’t stop in Hana. You should actually drive 10 miles beyond Hana on Highway 31 to the Kipahulu area, which is also part of Haleakala National Park. Once you arrive at Kipahulu, you can do some short hikes along the coast and to the Oheo Gulch. (Oheo Gulch is also known as the “seven sacred pools”, but that’s not the correct Hawaiian name and there is nothing sacred about them.) If you have time (2.5 hours) and energy available, hike the Pipiwai Trail through a bamboo forest up to towering Waimoku Falls. 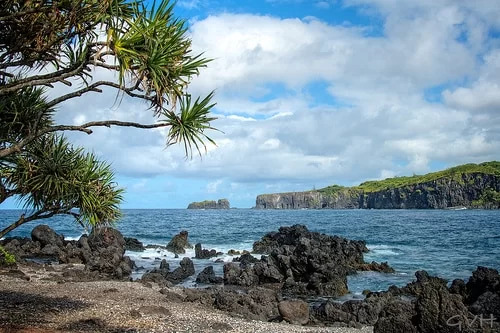 We offer lots of advice for great stops along with tips in our post on touring the road to Hana. As you return back to your resort from your drive to Hana, if you have time and daylight, take a few minutes to watch the windsurfers at Hookipa Beach Park just east of Paia on Hana Highway (36). See this link to find Hookipa on a Google map. A visit to Keanae Peninsula off the road to Hana offers beautiful views of the East Maui coast. 3. 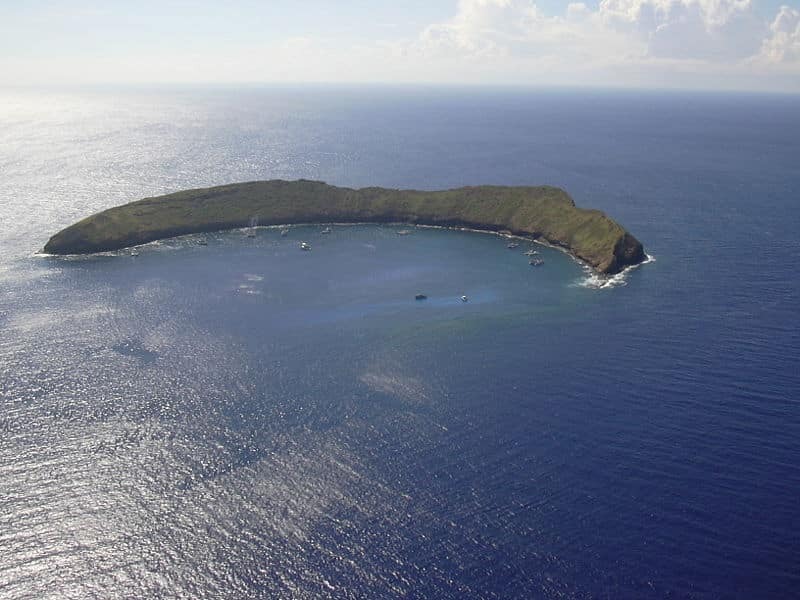 Take a snorkeling or diving cruise/sail to Molokini. This crescent shaped top of an extinct volcano is a bird and marine sanctuary. It is one of the top snorkeling spots in Hawaii. In addition to the good snorkeling, taking the boat ride out to the crater offers wonderful views of Maui. 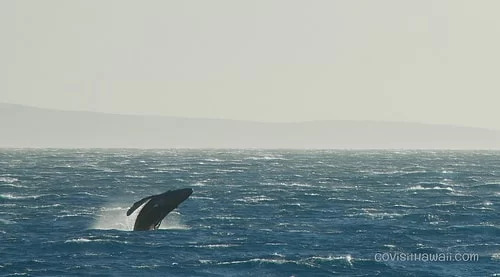 In winter months, the boat ride often ends up being an unofficial whale watching cruise, too. We recommend booking this excursion for early morning when the channel water is typically the smoothest. Only the top of Molokini volcanic crater stands above sea level. Photo credit to Forest and Kim Starr. 4 . See the Iao Valley State Park that’s rich with Hawaiian history. 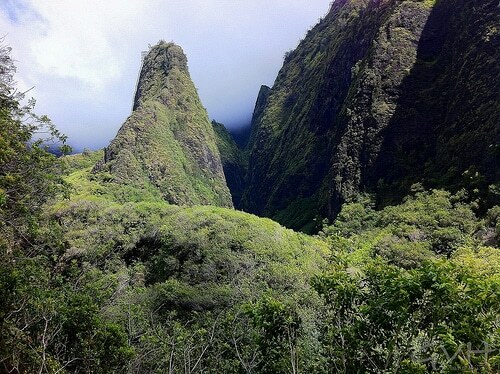 The park is beautiful and impressive with the star of the park being the velvet green Iao Needle that stands 2,250 high. 5. Watch for humpback whales with peak months being January through March, but you may see the whales from around December through April.You can either watch from the shore or take a whale watching tour. A humpback whale calf leaps out of the ocean. So those are my top 5 must do’s. If you do those activities, you’ll will have seen some of the best of Maui, plus you’ll still have time to relax at the beach or pool. If you do nothing else than these five things, you’ll have had a fantastic Maui vacation. Catch the evening cliff dive at Black Rock from Sheraton Maui. See Dragon’s Teeth in Kapalua. See a Maui luau. I think Maui has some really, really good luaus. Two of my favorites are Old Lahaina Luau and Feast at Lele. Enjoy a spa treatment. After all your Maui adventures, you’ll deserve to rejuvenate at one of the many top rated spas in Maui. Our favorite spa is Montage Kapalua Spa with their wonderfully relaxing facilities and the way they weave Hawaiian culture into their treatments. Walk around and shop in historic Lahaina town. Make sure you see the massive banyan tree that’s located off of Front Street. Get a shave ice and shop in quaint Paia. Just be careful that you don’t leave any valuables in your car. This town has a bit of a reputation for car break-ins. In fact, be sure you never leave valuables in your car in Hawaii. For more ideas, see our post with over fifty great things to see, do and try on Maui. If you find you’re on Maui when it’s raining, then check out these good Maui rainy day ideas. For a fun and practical way to see and do all of these top 5 Maui attractions, see our Maui vacation itinerary. It is certainly hard to pick only five, that’s for sure. My wife and I have done 2 of those 5 already in our past travels, and hope to cross off two more during our trip in April. We’re not big snorkel fans, so we probably won’t be off to Molokini any time soon. In its place, we usually add star-gazing from the beach (Ka’anapali is our favorite). If you happen to be in Maui during a new moon, it’s a real treat. Star gazing is fantastic almost anywhere in Hawaii. Star gazing on the top of Haleakala is beyond amazing. We stayed at the Kaanapali Hyatt last time and they have a special star gazing program from the top of their roof. We didn’t have the time to include it in our trip, but it sounded really nice. We’re planning to look into the Hyatt star tour for this trip, too. I’ll let you know if we make it and how it goes. That would be great, Kris. If you do get the chance, get up to the top of Haleakala at about 5 am or a little earlier. Then stick around to watch sunrise. If you go there on your first or second day, you’ll still be jet lagged and not have as hard of a time getting up early enough to get there for star gazing and sunrise. There is no “light pollution” there at all. You will see many more stars. We have seen lots of shooting stars there. It’s super cold, so be prepared for that. It’s very much worth the effort. Bring a small flashlight, it’s REALLY dark up there! The crowds are also a lot smaller now that the bike tours are suspended, though, I think as Sheila mentioned, they may be operating again in April. Speaking of top 5 things, I have seen some negative reviews about Molikini. Some people feel it’s too crowded and that the reef isn’t as pristine as it used to be. What is your opinion on this and would snorkeling in Lanai be a good alternative to this? Ericka – Very good question. I’ve snorkeled Molokini twice and I didn’t find it to be over crowded, but it’s been about two years since I last snorkeled Molokini. I just snorkeled Hulopoe Bay on Lanai back in September. The water was a bit choppy when I was snorkeling and there was a strong shore break, so I found it a bit tricky to get into the water. I was staying on Lanai, so I wasn’t on a snorkel tour. It’s a beautiful bay. One of the plus sides of taking the Lanai trip is that you get to see Sweetheart Rock. https://www.govisithawaii.com/2007/09/07/lanais-puu-pehe-sweetheart-rock/ Another plus is that spinner dolphins frequently come to the bay. – To avoid crowds, go on the earliest possible excursion in the morning. – One of my friends who has scuba dived around the world, said that he had one of the most awesome diving experiences at Molokini. I’ve e-mailed an expert I know to ask his opinion about Molokini. I’ll let you know what I find out. Ericka – I’ve still not heard from my contact. As an alternative, I’ve got a suggestion for you. Trilogy sails to Molokini and to Hulopoe Bay on Lanai. If I’m not mistaken, I think they are the only snorkel tour operator that’s allowed to dock at Manele Bay and use the Hulopoe Bay Marine Preserve. So, give them a call on their toll free number and get their opinion of Molokini versus Lanai. Here’s their number: 1-888-225-MAUI. I don’t think they’d steer you wrong. Great advice! You know, I used to LIVE on Maui and I never drove up past Hana! Time to go back for a visit! I’m SO curious to see what I’ve missed! We took the Trilogy Catamaran snorkling tour to Molokini – we did the 6:30am trip and the crouds weren’t too bad. I highly recommend Trilogy, I think we had about 30 people on the boat with a 4 person crew running the trip. I only wish I had tried out snorkling as the people on the boat who did said it was fantastic. For whale watching we went out on Kayaks, yes 2 person Kayaks. We went with South Pacific Kayaks (www.southpacifickayaks.com), we were in a a small group of 10 people (one of the 10 was our guide) and we ended up right in the path of 8 humpback whales. The whales actually swam right under and around us. We also kayaked up to an area where a sea turtle swam within touching distance of our kayak (but don’t touch them – it is bad for the turtles) and that is one of the places we snorkled. I highly recommend this group! You can also Kayak to Molokini (if you are in shape enough to do so) and they have other trips as well. I am now trying to figure out how to see the dolphins….. It sounds like a trip to Lanai is our best bet? Thanks for sharing your experiences. It’s good to hear that you also had good luck with Trilogy. Those Trilogy cats are smaller, so they can get into smaller and more pristine spaces at Molokini that the big boats can’t access. Your kayaking/whale watching tour sounds amazing! As far as seeing dolphins in the wild, that can be unpredictable. I saw them at Hulopoe Bay in Lanai every day during our stay there. Trilogy also does a trip there, maybe you could check with them and see if they’ll give you a discount since you’ve already booked one tour with them. If I remember correctly, the dolphins are more likely to visit the bay in the mornings. I am in the process of planning our honeymoon and I’m not familiar with any of the island on Hawaii. We heard that Maui is a great place to visit and based on the messages above it sounds wonderful. I have a few questions that may help with my planning and really appreciate the feedback if you don’t mind sharing it. #1. If we fly into Honolulu, is it difficult to get a flight to Maui? Do we need to book it in advance? #2. Where do you suggest we fly into on Maui? #3. What side of the island do you suggest we stay? East or West side? #4. Is Maui a busy tourist island or will it be quieter than Oahu? I appreciate your help and look forward to hearing back. #1 It is not difficult to get inter-island flights from Honolulu (HNL) but, if you are thinking of Maui, I’d recommend that you try if you can to fly direct into Maui. It will probably save you some time. Hawaiian Air, Go Airlines, Island Air, and Mukulele Airlines all fly from HNL to Maui’s OGG. Right you can find inter-island flights starting at $28 round-trip. So, if you can snag a deal like that, I’d book in advance. I’d at least book a flight 2 – 4 weeks in advance. #2 Fly directly in to the main Maui airport. The code is OGG. #3 West and South Maui have the vast majority of resorts. Kapalua, Kaanapali, Lahaina, and Wailea have some excellent resorts. #4 Maui is growing in popularity, but it much more quiet than Oahu especially in comparison to Oahu’s Waikiki area. That being said, Turtle Bay and Ko’Olina on Oahu are two very nice and quiet resorts. My 8 year old daughter ( who has been on an open ended world tour since 5) can’t wait until we get to Hawaii. I will put this in our Hawaii folder! Aloha soultraveler3 and mahalo for your first time comment! I think your daughter will love Hawaii. From reading your blog and following you on twitter, I know your daughter enjoys music, well she will be in for a treat in Hawaii. The unique sounds of the ukulele and slack key guitar blended with the talented voices singing in Hawaiian are simply divine. Hawaii is rich in learning opportunities from the sky to the sea for exmaple – to name a just some of the educational gems of Hawaii – there’s geology, astronomy, marine-life, Polynesian culture, and history. The Aloha spirit is real and it will captivate your entire family. Hello! We are Lydia and Victor the authors of objetivolima.wordpress.com (also nominated by Lonely Planet in the Best Spanish language blog category). We would like to congratulate you for your blog and congratulate you on your nomination and wish you all the best. Sheila this is for you, we are planning our honeymoon in hawaii. I have been to Waikiki like 5 yrs ago, but my to be wife has never been to hawaii, so i want to give her the best. Could you please tell me which would be the best island to go to in Hawaii. We dont want it to be too quiet or too busy but just have everything and ofcourse want the beautifull beach. So please advise which island should we go to as all ofthem sound really pretty and wanted some advise. Hi Sid – As you guessed, all the islands are really pretty, indeed. If you want to go to an island that’s not as busy as Oahu, but not too quiet either, I’d suggest Maui. I think Maui is a really great island for a first time visitor (your wife to be) and offers a little bit of everything. Maui has lots of pretty beaches, with DT Fleming Beach in Kapalua being my absolute favorite in all of Hawaii. Enjoy your honeymoon in Hawaii! Thanks sheila now, this is something which we cant decide either, the hotel, which hotel should we stay at, any suggestions. Sid – describe the type of hotel that you’d like….3, 4 or 5 star…remote or in a semi-lively area? Also what month will you be visiting? There are really lots of hotel options based on your criteria. If budget wasn’t a concern and I was planning my own honeymoon, I’d want to stay in the Ritz-Carlton Kapalua (West Maui) or Grand Wailea (South Maui). Also consider staying a condo which can offer more privacy and amenities and save you a little bit of cash compared to a hotel. VRBO.com and AstonHotels.com can be sources for finding condo rentals. The reason I asked about when is that I recommend the drier parts of the island (e.g. Wailea, Keihi) during the winter months. Since you’ll be visiting in August, where you stay “rain-wise” shouldn’t matter as May – October tend to be the driest months. don’t take a heli to the top. The times I did it it was boring and I got very sick. The engine noise was unbearable and the tour wasn’t very ecxiting. Kait – nice addition! Who did you zip with? I tseems I may have been a little aggressive with my schedule. On my first tript to Maui. My family and I were staying at the westin Ka’anapali. Wonderful snorkeling from the beach including swiming with turtles right there. My son loved it. We were supose to go on a snorkling trip but that got cancelled due to rough seas. So we did the trip to Hana. Oh my god what a view from everywhere. On the way to Hana we went and explored some lava tubes. We stopped for lunch then decided to go the other way back that strech of roadc was amazing it was sometimes desolate but still quite scenic. We then stopped and swam in the sacred pools. Wow they were cold. and had a few close calls as the roads are quite narrow. On the way back we decided to go to the volcano and drove all the way up only to find that it was closed due to freezing rain. Imagine that ice in Maui. We finally did make the Catamaran snorkling tour to Molokini. it was beautyful I would recomend it to all that go to Maui. We were supose to go swiming at turttle town but the murky water made this unsafe so we got to chase some humpbacks in competition. Jean-Marc – you really did pack a lot into one day.I hope you enjoy your next visit to Maui. Two weeks there sounds divine! Great list. We just returned from Oahu and Maui and had a great trip. Your site provided a lot of great information, even though we’ve been several times before. It seems like most of what gets the pub are the activities that are going to cost you something. Maybe that’s OK, because we discovered some great areas south of Wailea. Just drive through the resort area and the road narrows and starts to get pretty remote. Before long, you’re driving through the 1790 lava flow which is stunning in it’s own right. At the end of the road is a parking lot and the beginning of a hiking trail that takes you along La Perouse Bay. I’ve seen a lot of Hawaii, but this shoreline was the most spectacular scenery I’ve seen in the islands. If you’re up for the full hike, go a couple of miles on the trail/road to the “lighthouse”. Best to see this in full sunlight, but be sure use plenty of sunscreen (plenty of stretches without shade) and bring water. You will not be disappointed. Matt – thanks for the kind feedback and for sharing your experience of exploring South Maui. My family and I will be going to Maui over Christmas. I was wondering if we need to be booking excursions ahead of time? Do you know how busy it typically gets in Maui around Christmas time? Thanks! Hi Emma – as you’ve guess, Christmas is a very busy time in Maui. If there are a few activities that you really want to do over your Maui visit, it would probably be a good idea to secure reservations. Many activities providers offer discounts when you book online and in advance of the activity date. So, that’s definitely a plus for booking ahead of your visit. Who has the best zip line? I agree 100% except exchange whale watching for Ioa valley. That was nice but watching the whales was wonderful. Also if you go on the tour with Pacific Whale Foundation, you’ll be helping the whales preservation. If you join it’s only $60 and you get 25% off your tours and souveniers, etc. and you get a nice t-shirt. I can not go to Maui without a Luau. I did Feast at Le Le and it was really good. I love the polynesian luaus. My husband always goes for Haleakala sunset and I go to a luau. Other than the car break ins, I have always felt safe at Maui. Saw someone comment on VRBO. That is a great way to save. We used them in Bonaire also and got a $200 studio for $120 through owner and it was really nice. There’s also a place at Napili bay called Hale Napili and the people there are great and have get togethers for the guests like cook outs, etc. It’s an 18 room (studio) place that’s clean and ocean front ( as in walk out the door, “fall in the ocean”. Maui revealed is a great book that talks about it. That’s my 2 cents and I’ve been there 4 times and loved every minute of it. Oh, we were there around Christmas and it was great and I’ve never thought of Maui as crowded around Lahaina which is where we always stay. Wow, what a great list of things-to-do in Maui! I’d like to accomplish all of these so I think I’ll stay for a month if budget allows me though. Well, I love to surf… where’s the best beach where I can ride the waves? Anyways, Maui is sure to be a blast when I get the chance to visit. One day I would like to cover Hana Dr, top of Haleakala, Kipahulu area, – Pipiwai Trail hike can you suggest me route to drive and any other activities along way, and amount of time at each location. I would plan to start at 6AM. Hi John — are you saying you want to cover the top of Haleakala and Road to Hana including the Pipiwai Trail in one day? I’m not sure that’s feasible at all in daylight. Plus you’d be absolutely exhausted from all that driving as both those drives require a high amount of concentration. I strongly recommend that you consider splitting up the days that you drive to the summit of Haleakala from the driving the Road to Hana. The Pipiwai Trail and Kipahulu area are actually part of the Road to Hana, but beyond Hana. So, logistically, you’ll want to combine those in the same day. Also if could give me good address points that can be entered in the GPS, for the above locations, that would really help us a lot. Sorry, but I do not have address points some of these locations don’t even have a physical mailing address so to speak. See the links in the previous comment that provide as much direction detail as I know. Can you suggest places to guide me, tour to Maui for about 3days from Oct 17 – Oct 20 ? Appreciate you can give me ideas/info for places to visit and best things to do in Maui? John — Did you get a chance to read the top 5 things to see and do on Maui from this article? Honestly, it’s easy to put together your own plan for 3 days based on this list of the best things to do on Maui. This site provides information to help you make your own plans. Because this site is written on a voluntary basis, I am unable to provide individual assistance. You’ll have a fantastic time on Maui, so don’t worry. from the map I see Hana and Halekaela are close by about 10 Miles, so is it not suggestable to cover both drive to Hana and Sunrise at Halekala same day as I am driving from Lahaina Resort ? The summit of Haleakala is COMPLETELY separate from the Haleakala visitors center by the coast past Hana! If you want to try going to Haleakala for sunrise and then driving the road to Hana plus hiking the Pipiwai Trail all in the same day. Go ahead and try it. As I’ve said before, I don’t think it’s feasible to make the stops to enjoy the scenery all within daylight hours. Just see good info on your site. We have 18th, 19th and until 6pm 20th. Plan to see Halekela sunrise, road trip to Hana. 18th we plan to do Road trip to Hana from Lahaina, so what else can we do on same day? 19th we paln to do Road trip to Halekala Sunrise, what time we have to be to see sunrise? also any other activities we can do same day? How much time would these trips take approx? so we can plan any other activities. All your Haleakala sunrise questions are answered in the links provided here: https://www.govisithawaii.com/2007/07/17/see-an-unforgettable-sunrise-at-the-peak-of-a-volcano/ You will have time to plan in other activities on the same day that you go to Haleakala for sunrise. The activity options are endless — snorkeling, ziplining, shopping, sight seeing (like Iao Valley which is linked above in the article), touring tropical gardens (for example: https://www.govisithawaii.com/2009/10/15/review-mauis-garden-of-eden/ ), etc. I love driving up the Hana road. Another thing I love about Maui is visiting when there are humpback whales. They are quite a sight to see. My family and I will be in Maui this summer. Is this itinerary feasible? Day 4: We have no idea…. Ryan – Only thing that might be iffy is going to the luau on the night of arrival. Depending on how far away from Hawaii your travel originated, you could be a bit jet lagged and tired that evening. For example, we travel to Hawaii from the East Coast, in summer months Hawaii’s time is 6 hours behind ESDT. Plus flying takes at least 11 hours, so we’re zombies the first night and ready to sleep as soon as the sun goes down. We’d probably struggle to stay awake and fully enjoy the luau on the first day of arriving. I’ll be in Maui on the the first week of March and your website have been helping me a lot during this information gathering phase. The folks at Kapalua reviewed their trails PDF portfolio, so here’s the new link for you to update your Coastal Trailtip (above). Please note you’ll now have to mention the name of the trail on your tip, as the new PDF include other hikes. Thanks Fred. I’ve updated the link. This is a great reference for first-time visitors to Maui. It includes all the must-sees, in addition to other suggestions one might miss such as Black Rock cliff-diving and Honolua General Store. I work as a hotel concierge on Maui, and will definitely email my guests your link to this article to help get them started with their planning. Thanks again for excellent material on this website. Thank you Sameer! Hope you and your family enjoy Maui and the Big Island! We are coming to Maui Nov 8th to 15th. Have 4 kids below 6, 4 adults in the group. Plan to do hana trip, halaekela hike. snorkling weather permitting. For kids, we have seen sugar cane ride. Anything else you suggest for kids? are there any other activities whole group can take part in? bachi – unfortunately the Sugar Cane Train closed recently. Hi Sheila, My wife and I will be staying in Wailea area for an anniversary trip in July 2016 and we’re interested in the road to Hana trip. Do you have an approximate time of how long the trip would take roundtrip? Thanks for all of the excellent info on your blog! I’ve picked up lots of good ideas for our vacation! It’s been my experience that no matter how many times you visit Maui, where you go there or how long you stay, you will always find something new to see and do even if you spent your lifetime discovering it. Heaven smells like buttermilk pancakes, and those pancakes can be found at the “North Shore Cafe'” slightly hidden across from the Haiku marketplace.